“There is nothing like it in the language” goes a quote from review of the script for Sarah Kane’s final theatrical performance piece 4.48 Psychosis. I hesitate to use the word play because it is so much more, and yet somehow less (which I mean in a very complimentary fashion). Controversial and iconic, Sarah Kane is a legend of experimental contemporary British theater from the 1990s a decade that saw the arts in Britain flourish and return to the world stage with shocking violence and lasting importance. It gave us Kane along with artists like Damien Hirsh, filmmaker Danny Boyle and a third wave/invasion of influential musicians. 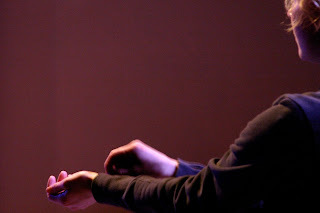 Kane’s debut theater piece Blasted cemented her reputation as a fearless innovator and provocateur. Perhaps this didn’t set well with Kane who felt many misunderstood her intent with Blasted. Kane gave us only five stage scripts (and one short film) in her all-too-brief career. After completing 4.48 Psychosis Kane finally succumbed to a life long battle with depression and hung herself while under the care King’s College Hospital. 4.48 Psychosis is raw and honest dispatches from an unquiet mind, desperate for solace and answers to questions that cannot be obtained. It is a testament to the power of theater to transport and transform and to return us to its ancient roots to show us, teach us and let us live. Portland OR’s defunkt theater has a commitment to provocative and groundbreaking works that while not always easy to enjoy are almost always important works of art. Much was made of a few changes in the company at defunkt theater as two members relocated to the east coast: to that I say, people come and go and from the looks of their current season it’s a reinvigorating change for the better. There performance of A Country Doctor, a surrealist riff on Kafka was met with applause from critics and now they return with a spectacularly engaging and truly powerful performance of 4.48 Psychosis under the impeccably astute direction of profoundly gifted actor-filmmaker-director Grace Carter. defunkt’s notoriously claustrophobic home at the Backdoor Theater has never felt more open under the abstracted production design of the gifted local architect and Drammy winner Bill Tripp who’s minimalist approach of a flesh-toned void gives light and hope to the darker proceedings that follow. Fellow Drammy winner Lori Sue Hoffman’s minimalistic yet ingeniously utilitarian costuming proves once again why she is a sought after collaborator, able to make a choice that is distinctly original seem like the only logical choice there could have ever been. Likewise the inclusion of Carter’s video installation work echoing the mundane repetitive frustration of an obsessive-compulsive mind is shocking, revelatory and soothing by measures. The sound design by Richard E. Moore is fraught with tension and the lights (by Emily Stadulis) augment what are three of the best performances to be seen this year on a Portland stage. The dream cast of Christy Bigelow, Joel Harmon and Matthew Kern perform the roles of facets of the mind; ciphers for the viewing of the internal struggle one has over the descent and ascension to and from madness. Bigelow is often seen as the face of the madness, the human personification of the self in a constant battle with itself in a emotionally riveting performance that rocks from raw un bridled fury, to deeply moving grief to surprisingly tender black humor. Joel Harmon is then by extension tasked with the unenviable role of the truthsayer without filter, the nagging obsessive voice in one’s head that speaks the ugliest, darkest fears, but also must comfort you when those same truths destroy the stability you crave. He does so with compassionate pathos that is commendable. Matthew Kern alternates (as do all the actors) from being a facet of the mind to a more delineated character, the mind’s memory/interpretation of the doctor/lover. The misplaced emotions that run riot in the doctor patient relationship are explored through the biased brutal lens of the one who feels betrayed. The betrayal is not assuredly justified in the physical, but again we are seeing all of this from inside the mind’s eye, always a suspect narrator. It is a brave performance by Kern and company that keeps the play from becoming a rote “depression hurts” cautionary tale. The action is choreographed (and that is the most appropriate word) as an unpretentious abstraction of modern dance at times, giving a subtle grace to the proceedings, even when the dialogue is vitriolic. The highly unusual nature of the script, to those critics uninitiated with more contemporary theater, may have seemed formless, but it is in fact highly structured in it’s own way. Sarah Kane left little stage direction in 4.48 Psychosis, but what she did holds holy weight. The piece opens with a lone actor and a long silence. This is not a lazy grab bag of portentous something-important-is-happening-here stagecraft, but rather a kind welcome, and a truthful moment to take inventory of our faculties as we begin. I was deeply moved by the performance and highly recommend it, with the caveat that I do understand some will not find this to be their cup of tea. There are those who believe theater to be best when serving a simple streamlined linear narrative and a thoughtful socio-ethical message. That theater has it’s place, but it is not at defunkt who pride themselves on risk taking adventurous works that push the boundaries of conventional theater. While it is extremely bleak, it is also humbling and hopeful above all, filled to the edges with tenderness, and passion. It is as I have stated before after viewing it’s opening night performance, arguably the most important theater performance to see in Portland this year. At 4:48 when sanity visits for one hour and twelve minutes I am in my right mind. 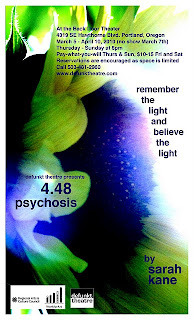 defunkt theatre is proud to present Sarah Kane's 4:48 Psychosis, a riveting and unflinching journey into the human mind at its darkest hour. Set in undefined locations, Kane's script contains no stage directions or defined characters - blurring the line between reality and illusion, poetry and dialogue. Like all of Kane's work, 4:48 Psychosis challenges conventional theatrical constructs and defies easy categorization; as The London Times put it "there's nothing else like it in the language." defunkt theatre company member Grace Carter directs.